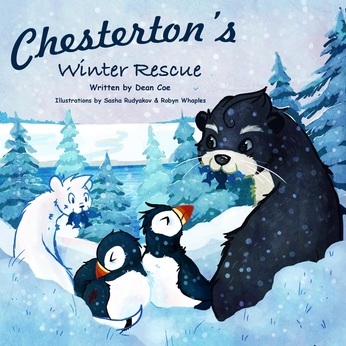 Chesterton’s Winter Rescue is written by Dean Coe and Illustrated by Sasha Rudyakov and Robyn Whaples. Dean lives in Sandwich, MA and is a nature enthusiast. Both illustrators are college students and Sandwich natives. Chesterton’s Winter Rescue is the fourth of the Chesterton stories. It is the story of a weasel who one cold winter helps to save two puffins who have been blown inland by a Nor’easter. I really enjoyed the rich descriptive language and how the illustrations complement this rich language. The story also has lots of information about weasels, puffins, and other Cape Cod creatures intertwined in it. This book would be great for classroom use as well; enhanced by back pages where there are facts about the creatures in the book, a glossary, and questions that really get kids thinking. The book ends “How can YOU help wildlife this winter?”. My son’s (3 years old) favorite part was when the otter caught the fish for the puffins and my daughter’s (5 years old) was when the puffins eat the fish. The Chesterton books can be ordered online athttps://deancoebooks.com/books/ or bought at some local shops including Titcombs Book Store. Dean: My first book, Chesterton Keeps His Town Jumping was published in June of 2014. After writing 3-4 stories about Chesterton and reading them to my Beta group, my grandchildren, I decided to select one and publish it. Simultaneously, Sandwich MA was celebrating its 350th Anniversary. The setting I would choose would be the famous Sandwich boardwalk, designated by National Geographic as one of the top 10 boardwalks in the US in 2012. (Note; In 1990, after the Perfect Storm, the boardwalk, established in 1875, had been destroyed by the now famous Nor’easter. I founded and chaired the Boardwalk Reconstruction Committee leading a community rebuilding effort.) The story was adapted to the 350th anniversary. It is all about community and families and focuses on the favorite summer past time of jumping off the boardwalk into Mill Creek at high tide, a rite of passage for Sandwich kids. We were thrilled to find, Chesterton Keeps His Town Jumping was in the top 20 Best Books of the Year at Titcombs, Book Shop in 2014. Me: Why write children’s books? Dean: Young minds are precious and the nourishment that is derived from a parent reading to and with a child is like no other. To be in a position, as a children’s author, to be the conduit to that experience is priceless. Dean: Read the story behind the story. It all started with a walk in the forest with my granddaughter when we saw an intriguing little creature that captured my imagination. Me: I really like how you intertwined fact within the story. What made you do this? Dean: The books are nature books. Each introduces some basic nature awareness through the eyes and habits of a good ‘natured’ weasel. (Book two-Chesterton Saves The Whale is actually based on a true story when I encountered a pilot whale while kayaking in Mill Creek. The story has a happy ending which differs from the true story.) Each book has a running glossary of terms allowing children or parents to gain further knowledge about the environment of the story. As seen on the back cover, each also has the endorsement of a professional in the subject matter. Me: Do you plan to write more stories about Chesterton? Dean: A very timely question? Yes but….when I decided to publish the first book I broke from tradition in a huge way. Since I was writing for kids, why not get kids to illustrate the stories? After consulting with elementary teachers and librarians, I decided to try and find a high school artist who had the potential to illustrate a book. I wound up with two illustrator friends, one who handled the characters and the other the backgrounds and color selections. They are now in college and I am waiting to hear from them as to there availability this summer. I am also working on a mid-grade mystery which will not be part of the series. Me: Anything else you would like to tell me about? Dean: The books are available in book stores and in many retail locations on the Cape, and at The Thornton Burgess Society and Greenbriar Nature Center in Sandwich, at the Cape Cod Museum of Natural History in Brewster and The MA Audubon Center in Wellfleet. Bulk orders and custom signed copies are available at deancoebooks.com. Many are sold through my school visits and writing workshops for elementary schools. Custom signing orders can be arranged by emailing me at dean@deancoe.com. When author, Dean Coe, and his granddaughter Ashlan were walking in Shawme Forest, Sandwich, Massachusetts, they met a small creature that scooted across the trail in front of them. Having easily eluded some barking dogs in pursuit, the winsome character stood momentarily and almost appeared to invite the two to join in the fun. The brief encounter became the impetus for Coe’s Chesterton stories about a spirited, ever-curious, good-natured Cape Cod weasel. The first adventure, Chesterton Keeps His Town Jumping, is about being brave. When jumping off the Sandwich boardwalk bridge, a 150-year-old rite of passage becomes a political issue, Chesterton and Sandwich kids of all ages rally and create a rising tide of opposition to a ‘no-jumping‘ mandate. It’s a fanciful story about community and doing the right thing. The second adventure, Chesterton Saves The Whale, is based on a true story, but with a surprise ending, about a stranded pilot whale discovered by the author while kayaking in Sandwich’s Old Harbor. Chesterton’s Scary Breakfast is a fun tale in which Chesterton’s spontaneous, whimsical and questionable decision creates an adventure for more than just Chesterton. Chesterton’s Winter Rescue introduces readers to the plight of our wildlife in the grips of a severe Cape Cod winter. Chesterton encounters two strange visitors, a couple of puffins, who have been blown to shore in a harsh Nor’easter. With the help of Cousin Otter, he manages to provide shelter and care to the homeless creatures. I am always looking for people to join my Usborne team, host parties (Facebook or home), or just share these wonderful books! For more information visit https://w4728.myubam.com or contact me atmollyhubner@gmail.com .